Over 25% of the Earth’s crust is iron, therefore, it is one of the most common reasons water treatment is needed. Iron will manifests itself in two different forms: Ferric Iron is a suspended solid which will make the water appear colored, ranging from light yellow to bright orange in color or Ferrous Iron which is a dissolved solid and colorless, but if allowed exposure to air, it may oxidize and appear colored, also. Certainly, iron causes the most noticeable problems. It stains fixtures and can require strong chemicals to remove the orange or rust colored stains. 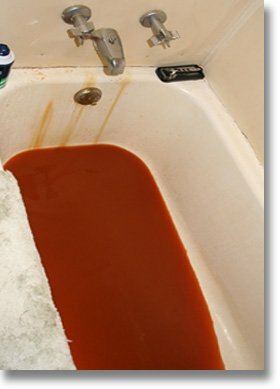 Clothes washed in water with iron issues will often turn brown or orange. It can cause the water to impart an unpleasant taste. 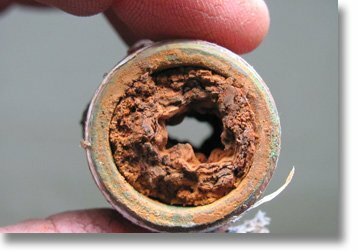 Iron will build up in plumbing, sometimes to the point of completely blocking the pipes. Iron is generally measured in parts per million (ppm) or milligrams per liter (mg/l). The acceptable limit in Maine is less than 0.3 mg/L. Even smaller amounts of iron in well water can cause staining on clothes and fixtures and have an unpleasant taste. After an onsite water test to find out whether it is mostly ferric or ferrous iron, we can treat the water. An Iron Filter is needed typically, but at times a Softener or Greensand Filter is installed instead or two systems may be needed. An Iron Filter consists of a mineral tank filled with gravel and media (often referred to as a bed) and a control head. At times, a micronizer (injects air) may need to be installed with the iron filter. As your water passes through the bed of the filter, iron in your water is attracted to media particles. Iron attach to the media inside your tank, removing them from the water before it exits the filter. Eventually the media inside the tank becomes saturated with iron particles. The timer on the head of the system is set to automatically backwash the filter every few days to clean out the media inside the tank. The amount of iron in the water and daily usage of water will determine how often a system should backwash or clean itself. Iron filters require very little maintenance but the media bed inside the tank does eventually wear out. The media will need to be replaced every 1-5 years, again depending on the level of iron and amount of water used daily. If there is a power outage, or after daylight savings, you will need to reset the timer on the control head. This is important to reset because you don’t want to unknowingly use water during a backwash cycle. Please click here for resetting the time instructions. 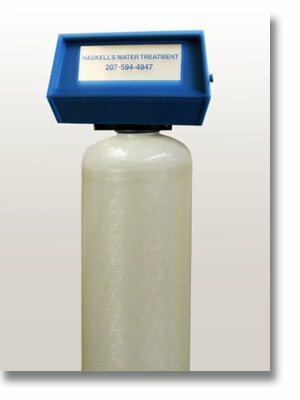 Call Haskell’s Water Treatment Inc. today at (207) 594-4947 or 1 (800) 244-4947 for more information.